Floor remodel projects can be both exciting and frustrating. With so many design ideas, color options, patterns, etc. the decision process can become quite overwhelming. It may surprise you to find there are many different materials to choose from too. It helps to go into your flooring remodel with an idea of what you are wanting to accomplish, aesthetic wise. Consider your current home decor, room design, furniture, and wall colors. You’ll want to choose a flooring type that compliments these things, rather than one that clashes with them. Here are 7 floor design ideas that can help you narrow down your search and make the process more enjoyable for yourself. Laminate flooring is a tried and true flooring material that has been around for many years. While it may not be considered the “classiest” of flooring options, it is certainly a budget friendly option. Its easy installation process makes this a top choice for those wanting to knock out a renovation project in a day or two. Todays laminate flooring has a click-lock design that allows the planks to snap together like puzzle pieces. The soft particle board material makes it easy to cut the pieces as needed so they fit nice and snug around corners and awkward spaces. Laminate flooring is great for high traffic areas, as it is generally very durable. It has what’s called a “wear layer”, meaning it is protected from dents and scratches. The surface also resists stains and is easy to clean when things get spilled on it. Its great for bathrooms, kitchens, mud rooms, and other rooms that tend to have moisture since it resists water. Carpet is always a great flooring choice. There are many different carpet styles to choose from, as well as many different colors and patterns. As a matter of fact, you can just about get carpet in any style and color you want. Not to mention the comfort and softness it provides when you’re playing on the floor with your kids or when you wake up in the morning and step foot out of bed. It also makes for a warm walking area on those cold winter days when the rest of the house is chilly. Carpet also offers the additional benefit of noise reduction because it makes for a great noise buffer. It helps to mask the sound of people walking around in the home, as well as talk and chatter in the home. Numerous studies throughout the years have shown a decrease in allergens in homes with carpet because the carpet prevents allergens from becoming airborne. It traps them down inside the fibers of the carpet until they are later vacuumed out. Hardwood flooring adds a beautiful touch of elegance to any home. It flawlessly compliments just about any existing home decor and design. Unfortunately, doesn’t come with a cheap price tag. Depending on your budget, hardwood may or may not workout for you. Hardwood is a great choice for those who suffer with allergens. It’s also one of the more sanitary flooring options on the market. Hardwood flooring requires less maintenance when it comes to cleaning. Keep in mind that hardwood flooring is more prone to dents, scratches, scrapes, and scuff. If the flooring does become damaged, you can generally sand that area down and re-stain it if needed. 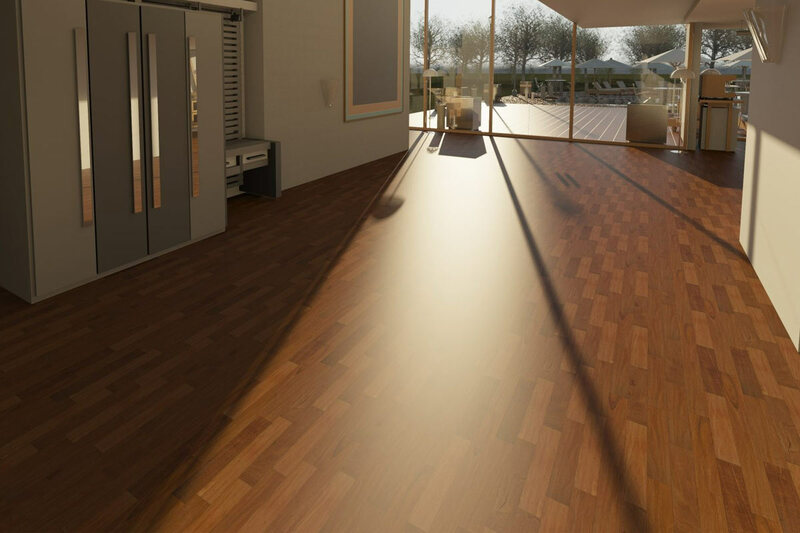 Hardwood flooring uses less water and energy to manufacture, so it makes it a more eco-friendly choice than other flooring options made with synthetic materials. Vinyl flooring is a good choice if you’re looking for an “easy to maintain” flooring option. Since it is a water resistant flooring choice, it’s a great fit for bathrooms and kitchens. When it comes to variety, vinyl flooring doesn’t disappoint. With many design styles to choose from, you’re sure to find a style that catches your eye. Vinyl flooring doesn’t get cold in the cooler months, so it is a little more pleasant to walk on barefoot. The price range for vinyl flooring can vary anywhere from fifty cents per square foot to upwards of ten dollars per square foot. This price difference is determined by the quality of the vinyl, as well as the style. Properly installed vinyl flooring will be around for the long haul and will last you many years. Its durability makes it a great choice because you will get your money’s worth out of it and then some. Printed vinyl comes with a protective layer that acts as a barrier against spills and stains. This makes cleanup a breeze with a simple wipe down or a quick mop. The durability of ceramic and stone tile flooring is hard to beat. It holds up to heavy traffic, wear and tear, and spills without showing signs of aging. It is possible for sections of tile flooring to break, but if this happens that section of broken tile can be cut out and a new piece put in its place. When it comes to design and styles, tile is very versatile. You can also lay the tile pieces themselves in abstract formations to create a customized look in your home. Tile flooring does tend to be cold to the touch, you do have the option of adding a heating element underneath the tile in the installation process. The heating element will disperse heat evenly throughout the tile flooring and you also have the option to turn it off and on as needed. More and more, cork flooring is growing in popularity. It is a great heat insulator, it’s soft to the touch, it’s mold resistant, and antimicrobial. It’s not too terribly water resistant, so caution will need to be used if cork flooring is in areas that have high moisture. This is a great flooring option for someone who prefers eco-friendly materials in their home. Concrete flooring can be rather expensive due to the labor involved in pouring and leveling the flooring. This flooring is extremely durable and it helps to cut energy bills due to its ability to absorb heat in the home. You can add dyes and pigments into the pour to create a range of colors, as well as stamp patterns into the wet concrete before it dries. Some homeowners stamp the wet concrete to give it an appearance of tile flooring. After it dries it looks like a tiled and grouted floor, but it offers much more longevity than a tile floor would. The professionals at myfloor.net.au can discuss the many design and style options available with concrete flooring. Nadya Jones on Why does my bathroom smell? Every Day Home & Garden is a UK home improvement & lifestyle blog written by a dedicated and diverse team of authors. If you would like to become a guest contributor, click here.